Chicken dishes are extremely diverse. 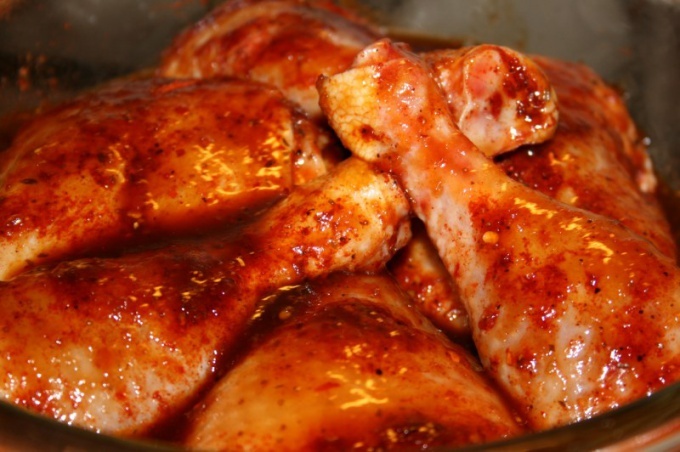 Chicken legs attract Housewives primarily because it does not need special treatment. A delicious dinner will work even if the legs just to fry. But if you have five hours of free time and a desire to please their loved ones an unusual dish, prepare chicken in a mayonnaise-mustard filling. oven and other kitchen utensils. Prepare chicken legs. Rinse them and dry. You can, of course, put them in a bowl or dish, but it is better to dry use a piece of cotton or linen fabric. Legs need to marinate. To do this, until they dry, take the garlic mixture for lubrication. Have a not very large head of garlic, peel it. Wedges crush pressure. If you do not have such, you can chop the garlic and grind it in a porcelain mortar. Put the garlic in a small bowl. Add the 1 tablespoon salt and spices. There's a mix. The amount and composition of spices depends on your taste. The dish and without them it's rather sharp. The fact that you got brush all over chicken legs and leave them to marinate for about four hours. Mixtures do not regret, cover the legs fully and fairly thick. Preheat the oven to 170°C. Take a dry pan, put on his legs. Pour some water. Put the dish in the oven and bake until soft. It will take half an hour or a little more. For filling take 100 grams of mayonnaise 50 grams of prepared mustard. Mayonnaise can be anything, but best of all is the classic "Provansal", without any supplements, especially if you marinated the chicken with lots of spices. Mustard from a tube or from the jar. Remove the pan from the oven. Legs lubricate the thick layer of fill. Put all of it back in the oven. Bake the dish at the same temperature until done, that is approximately a quarter of an hour. Put chicken on a dish and serve hot. As a suitable side dish boiled potatoes, mashed potatoes, roast and steamed vegetables. Can be cooked in a similar way fried chicken to take along on a picnic. For this it is best to wrap it in foil. They, of course, a little cool, but still remain very tasty and juicy.